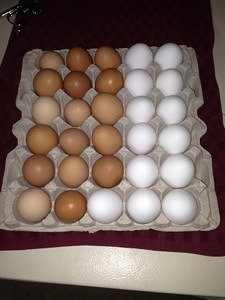 Today when we went out to gather the eggs we got 24, our first 2 dozen day. About a month ago the production jumped from about a dozen to 18-20 as the new chicks started laying. This entry was posted in chickens and tagged chickens, egg production. Bookmark the permalink.